Alan Ayckbourn is, after Shakespeare, Britain’s most performed playwright and acknowledged as one of its most skilful directors. In 50 years he has written more than seventy plays and directed three times that number emerging as a formidable dramatist of international renown. Dismissed at first as a “mere boulevadier”, he is now seen as an outstanding modern comic playwright, exploring themes of social and political importance with a bleak eye and a capacity to construct comedy out of the experience of the middle class audience. This book explores the range of his work which covers light comedy, farce, theatrical cartoon, musicals and plays for children. It defines the early influences and the developing themes, concentrating on Ayckbourn’s technical skills and his challenges to Aristotelian unities. It traces the playwright’s journey from observer of middle class dilemmas through moral and ethical commentator, and on to his concentration on fantasist behaviour and the nature of long term relationships. The comic eye which lies at the heart of this work is explored as a product of both dramatic technique and theatrical experiment. 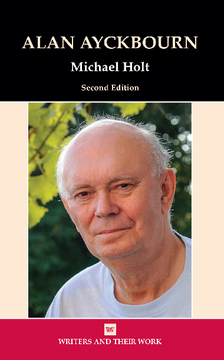 Michael Holt was Senior lecturer in Drama at the University of Manchester for 27 years He specialised in aspects of contemporary play-writing, performance and production and the quasi-theatrical leisure industry. He remains a theatre designer of National and international repute. He has worked with Alan Ayckbourn as a designer for over 40 years in Scarborough theatres and elsewhere, and is the author of books on stage and costume design.